222 pages | 5 B/W Illus. White supremacist groups are highly secretive, so their public propaganda tells us little about their operations or the people they attract. To understand the world of organized racism it is necessary to study it from the inside by talking to their members and observing their groups. Doing so reveals a disturbing picture of how fairly ordinary white people learn to embrace the vicious ideas and dangerous agendas of white supremacism. This book takes the reader inside organized racism, revealing the kind of women and men who join groups, such as the Ku Klux Klan or neo-Nazi skinheads, and what they do in those groups. The volume collects significant published works from renowned scholar Kathleen M. Blee's work on racist activism, alongside new essays on the theories, methods, and approaches of studying racist activism. Discussing topics such as emotional issues in research, the place of violence and hate in white supremacism, and how women are involved in racial terrorism, Blee makes use of a range of sources, including oral histories, ethnographic observations, and interviews, to shape her findings. Written by the pioneer and leading scholar of women in racist activism, this volume is essential reading for students, scholars, and general readers interested in the areas of social movements, politics, race studies, and American history. Over the past three decades, Kathleen Blee has done more than any other social scientist to expand our understanding of racist activism. Here, she presents and reflects upon her prodigious body of work, interrogating common assumptions as well as her own findings. Both a deeply honest portrait of the perils and payoffs of studying racist hate and an incisive examination of white supremacy’s past and future, this volume is expansive in every sense—traversing historical periods, geographic boundaries, and theoretical orientations. 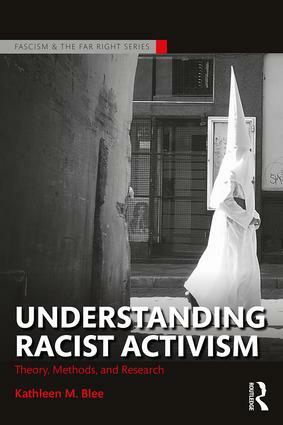 Understanding Racist Activism is an indispensible resource for researchers, policy-makers, and anyone else concerned with the specter of organized racism. For over three decades Kathleen Blee has produced ground-breaking scholarship on the contemporary US far-right. Her body of work represents the most insightful and sustained effort to help us understand the individuals and organizations that continue to mobilize around hatred and fear and some notion of racial and cultural exclusivity. This collection of her work is much needed and a "must-read" for a broad range of students and anyone else interested in learning more about where some of the current political polarization emanates from. From one of the very best scholars of the American racist right—an unusually brave scholar who examines it from the inside—we now have a collection of her superb articles on investigative methods as well as the substance of its ideology and organization. The book is both a guidebook for those who want to study the far-right and a fine introduction to general readers who want to understand it. Kathleen Blee is unparalleled in her knowledge of America's white supremacist movement. For decades, she has delved personally into the worlds of racists, taking the time to hear them out and learn about their real lives. This makes her work uniquely insightful. Anyone who wants to really know the world of white supremacy needs to read Blee's masterful research. 7 Does gender matter in the United States far-right? Kathleen M. Blee is Distinguished Professor of Sociology at the University of Pittsburgh, USA. This new book series focuses upon fascist, far right and right-wing politics primarily within a historical context but also drawing on insights from other disciplinary perspectives. Its scope also includes radical-right populism, cultural manifestations of the far right and points of convergence and exchange with the mainstream and traditional right.